The cloth for the glove insert shall be a Nomex/Lycra spandex blend (98% Nomex N303; 2% Lycra spandex), or equal. Nomex 303 consists of 92% Nomex, 5% Kevlar and 3% Antistat. The glove inserts shall be treated with a durable water repellant treatment, and shall be tan in color. The glove insert shall comply with Danalco's Hanz Combat Utility Glove, Full Grip, Product Numbers 2207 (Tan, Small/Medium) & 2208 (Tan, Large/X-Large), or equal. The glove insert shall provide warmth and protection in both cold weather and moderate temperature environments for tasks requiring maximum dexterity and tactility. The glove insert shall be flame resistant (FR) with no-melt/no-drip, fast drying, have water repellency, good durability, insulation, very good manual dexterity/tactility and grip, and compatible fit with a mitten or glove shell. 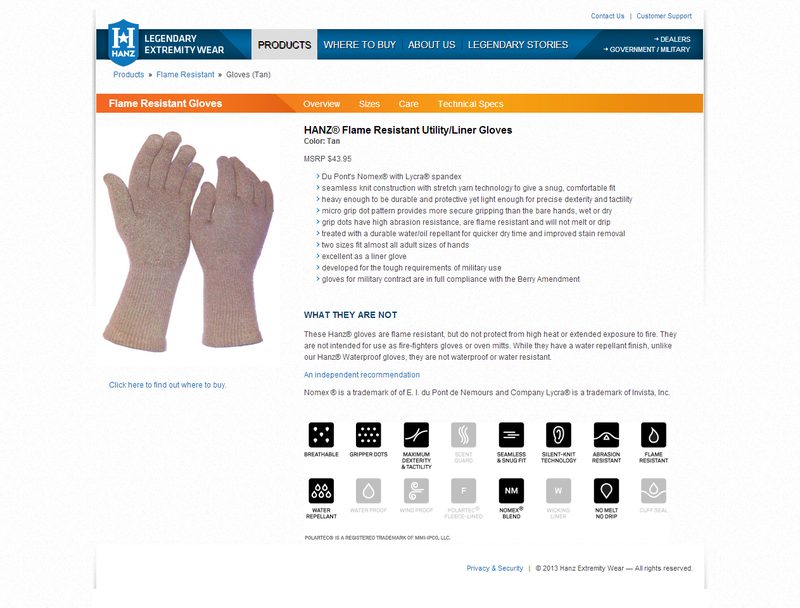 Each glove insert shall have a label to identify the item, its size, and use and care. The glove insert shall be seamlessly knit using a 13 gauge machine (i.e., 13 needles per inch of the needle bed) and constructed from a Nomex/Lycra spandex blend with flame resistant grip dots on the palm side, or equal, that shall cover the entire palm and fingers. The glove insert construction shall be durable to minimize pre-mature holes at stress points, and shall provide a next to skin fit with the gauntlet providing a comfortable form fit on the wrist and forearm. The cuff shall be turned under and hemmed using a blind stitching machine inside and using Nomex Tex-27 thread, or equal; elastic shall be knit into the cuff, or equal, providing a snug fit for the wearer. 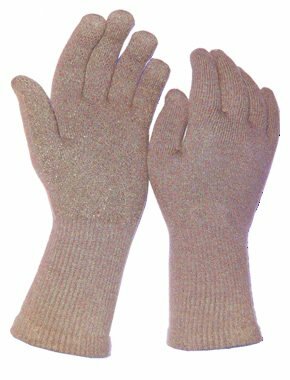 The glove insert must provide sufficient lengthwise and widthwise stretch to fit the hand comfortably and achieve required dexterity and tactility, and be able to return to approximately 90% of its relaxed dimensions after wear.